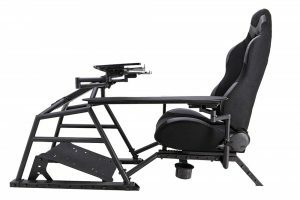 Sim Racing Ergonomics – Selah. I love sim racing but it’s been aggravating some sore points on my body and causing me to miss out on what I love doing. So, I put together my thoughts so far about sim racing comfort to help me, hopefully others, keep on enjoying the sim racing we love. As I noted in previous post reviewing the GTEYE Progressive Brake Spring for the Logitech G27, I suffer from Achille’s tendonitis from barefoot running. This has actually kept me from sim racing for months at a time. At one point, I realized I had to stop sim racing to let my heel recuperate. After having stopped running and treadmill walking for a month, and being away from sim racing for a week, I’d come back to sim racing and realized I had to give up my stiffer GTEYE progressive brake spring. Even without running or walking the brake pedal aggravated my Achille’s heel. Don’t get my wrong. That brake spring is excellent but not for those who are recovering from strained tendons in their feet. Some time after I wrote the above, I switched to left-foot braking. In the long run, it reduced the strain being put only on the right foot and helped me get back to sim racing. Yes, it did take a lot of seat time to get up to speed with left-foot braking but less time than you may think. I might have been crashing quite a bit my first day, but within a day or two I was safe on the track, if a little slow, and a week or two later my times were very nearly what they were before. Months later and it’s not even an issue, I’m faster than ever. For proper rehab of Achilles tendonitis, google for it and you’ll find a number of things to do. Key points are to ice while there’s pain, rest until there’s no more pain, avoid strenuous use of the heel, begin stretching begin working out the heel. It appears eccentric exercises on the heel work well for Achilles Tendonitis. If the condition persists, visit your doctor. One of the most important things I’ve learned recently is that shoes are going to be critical if you’re logging many hours of seat time per week or if you have a heel problem like I do. After spending over a year sim racing in sock feet, and then feeling the discomfort and pain of Achille’s tendonitis as I tried to work the pedals, I tried our some basic around-the-house shoes. They have a good, sturdy sole but are meant to slip on rather than tie up. Amazingly, it immediately felt better and I was able to put in 30minutes of lapping without feeling any discomfort. I’d feel usually feel sore after 20-30minutes and stop, without shoes. I’m not exactly sure what the improvement is but I have a few guesses. First would be the position of your heel, lifting it off the ground due to the built-up sole of the shoe. Next is the position of the contact part of your feet with the pedal. With socks it’s probably the ball of your foot. With a shoe it’s distributed by the sole so the forces get spread out more. It’s also possible that the shoes are keeping my feet in place more whereas without shoes I’d be constantly adjusting my foot and that would translate into micro-movements in the heel causing more wear and tear than needed. At any rate, I don’t think I’d go back to sock feet now even if my heels were 100%. Check out sim racing shoes, they’re a thing and they look really comfortable. One day I’ll have to get some. The other bit of ergonomics I’ve been through is seating support and seating position. After a desk job all day and an hour or two of sim racing in the evening your back can really start hurt. After six months of iRacing my back is sore to sleep on. I use a standard, hard-back, wheeled office chair and one thing I started a few months ago was to put a pillow behind me. This felt really comfortable…for the first little while! But, that’s when I started feeling very sore trying to sleep on my back. It occurred to me that the pillow was pushing me away from the back of the chair and causing me to slouch. That’s not good for racing and, of course, it’s not good for your back because nothing is really supporting your back – it’s all muscle tensed up for the whole racing session. So I’ve removed that pillow and now I’m sitting fully back in the chair against the hard back. I can feel it supporting my lower lumbar area and helping more than the pillow. After a year of sim racing, when I knew I wanted to stick with it, I purchased an Obutto R3volution which comes with a faux racing bucket seat. The Obutto seat further supported my back with lumbar support, provides more comfortable padding and material to sit against, provides better support for your shoulders, can be tilt-adjusted to suit your most comfortable position, and, perhaps most importantly, sits you at a height and position that creates a better angle for your legs and feet to meet the pedals. As I mentioned, I love sim racing and I hope I can keep doing it for a long time to come. Doing anything for long stretches of time, and repeatedly, can cause problems for your body. Always take care of your body and you’ll be able to enjoy your sim racing for a long time to come! Previous Previous post: Nitty Gritty: From Mayhem to Ministry. A Testimony.